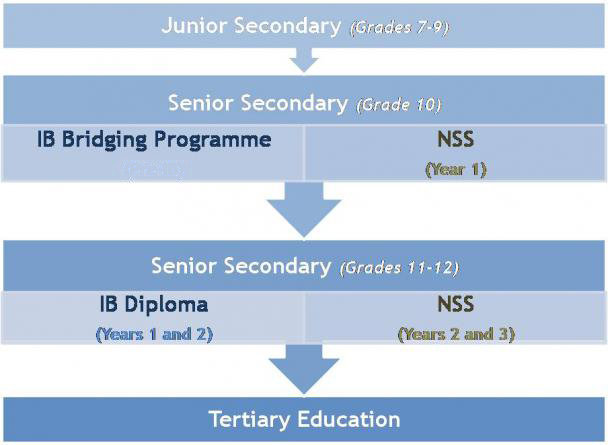 Prior to the IB Diploma Programme, DBS is offering the Bridging Programme (equivalent to Grade 10), which focuses mainly on the development of skills in preparing students to meet the requirements of the rigorous Diploma Programme. In addition to the subjects offered, students are encouraged to participate in various extra-curricular activities including service projects where they give back to the society. It is our belief that experiential learning can consolidate their knowledge obtained in classroom and encourage students to apply such knowledge in the real world. It would be ideal for students to join the Bridging Programme prior to the 18 months of Diploma, since Grade 10 will provide a platform for students to have a taste of the learning environment and methodology of the IB, and also to develop and polish their various skills necessary for both their Senior Secondary and Tertiary education. Both students and parents will be informed and guided through their choice of their subjects in preparation for University entrance, and seminars are conducted regularly. There is also an Advisor-Advisee system , where Teacher Advisors are assigned to individual students, not only overseeing their whole person development, but also providing a direct contact person for parents. Towards the end of the IB Diploma, Teacher Advisors will write individual reference letters for their Student Advisees for University application.